Goatboy can’t resist making Daemon Princes any time he has time off – and he’s been a very busy goat. First of all – happy Labor Day! 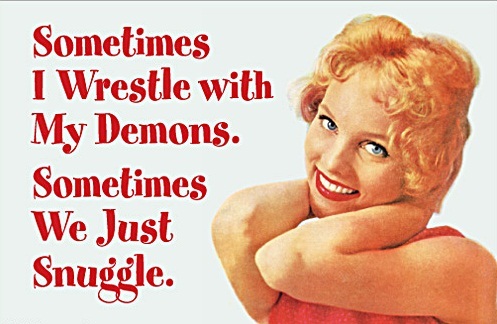 I am very glad I have it off as I was in a wedding this weekend so actually having 2 days off is a great way to rest. Also it gives me a chance to work on some commissions, get caught up with some postings, and actually have a bit of a break. Oh and it let’s me mow, clean, and detangle my yard. It never ends in the Goat household. But this isn’t some kind of suburban life blog – this is a Warhammer 40k editorial! With that – lets get on with what I wanted to chat about. Every few months I always get the itch to work up some new Daemon Prince models. I have always loved the massed MC list whether it was the humble beginnings of the Nidzilla army, the return of the Flying Circus, and the second coming of Tetrageddon. There is just something awesome about amazing some big monsters, throwing some dice at your opponent, and hoping the averages fall in your favor. It helps out that I love painting big monsters as I find them very relaxing to build and paint. The big areas of flesh, the weird accidental conversions, and the idea of creating a miniature full of chaos is just too cool for school. This last batch of MC’s came about as a client/buddy wanted me to work up 2 new Daemon princes for his army before WargamesCon. One of my more “famous” conversions was what he wanted me to emulate and after discussing some of the initial “bits” I needed I got to rework my initial daemon prince idea into a newer, leaner, and meaner conversion. This of course made me have to remake 3 new Tetrad models for myself because the voices told me too. With that in mind – let me show you the nonsense I threw together and painted up. 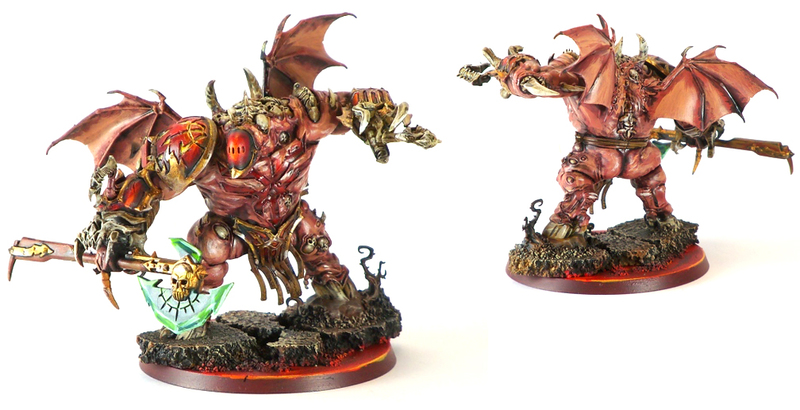 First – here is the initial Daemon Prince that I love. He is probably my favorite conversion and while he is over a year old he is still my best bud. Heck he even survived a car wreck that had a Khorne Skull Crusher fly off the car seat, take out a ton of deamons, and cut this guy in half at the base. 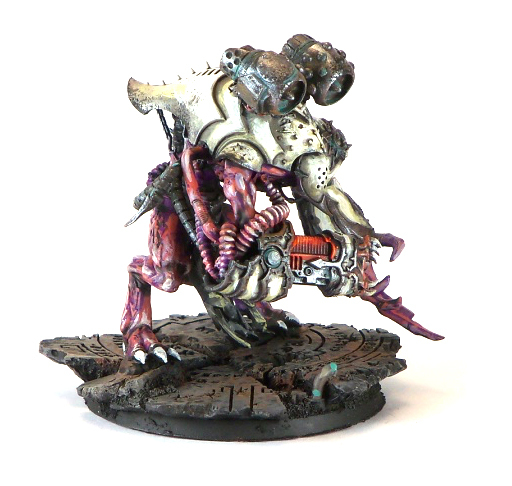 He is played as my Slaanesh Daemon Prince – or as I like to call him the D***CENSORED*** Prince. Build parts – Talos Main Body and Head/Mask. Forge Fiend un, Daemon Prince arms and legs. The jet Pack is a cut apart Max Mini jump pack. Tentacles are from the Tentacle Maker from <a href=”https://www.greenstuffindustries.com”>Green Stuff Industries</a>. I think the base is from an Aegis defense line bit that was randomly in a miniature bag after an event. Fun times when you find stuff instead of losing stuff. 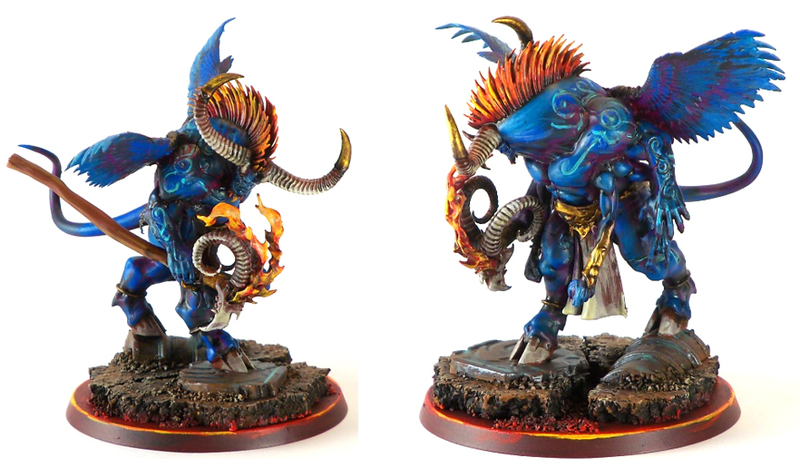 Here is the Daemon Prince I created for my buddy Vince. Again it is heavily influenced by the one above with most of the same parts. 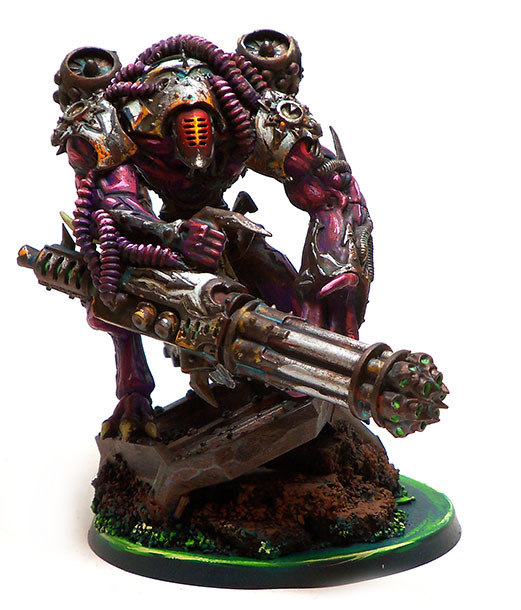 The gun is from the Hellbrute kit – which while not a very good model the kit comes with so many goodies to make a daemon prince out of. I don’t remember where I got that base – I think it was from a bunch a buddy game me as he was cleaning out his house of 40k nonsense. 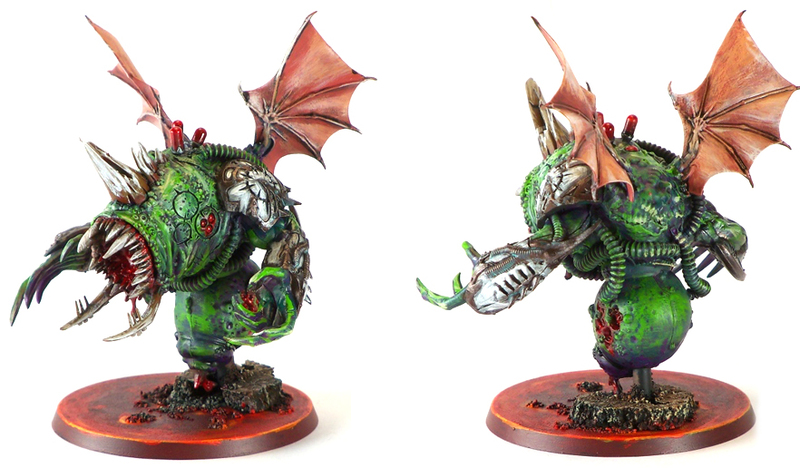 Next up – after that initial build I thought – heck I need to do more Daemon Princes for myself. This meant I needed to kit bash a Khorne, Nurgle, and Tzeentch prince. I went through my bits, found a ton of random stuff and got the following built and painted. Parts used are some Daemon Prince bits, the AOS flesh monster thing for Khorne, Wings from the Scourge kit, and of course a Chronos/Talos mask. I have wanted to paint this model for awhile and found the idea of tiny baby wings to be pretty dang fun looking – thus this guy got created. I wanted him to have an Axe as most of the time my Khorne DP has an Axe of Khorne. I experimented with the new GW Gloss washes for the metallic and found them to be pretty dang cool and worth a try out for those wondering. Next up I built my Nurgle Prince. I have a decent one I use that I made a long time ago but I felt like I needed a new one. 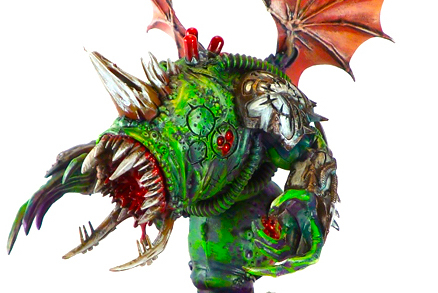 I have had bits from those cool Nurgle monster riders for awhile and have wanted to make a giant mouthed monster. Finally I got it all to fit together after grabbing an old Bile Drone. I continue my use of tiny baby wings as again – they look awesome to me. Nurgle Monster head, Scourge Wings, Daemon Prince Arms, Bile Drone Body, Tentacles/Green Stuff, and random Talos bits for the blood tubes. I want to go back and scrap off the paint so he looks like he is flying. I had to cut apart some random flesh bits to cover up the needed “armored” shell from the Bile Drone body. He feels a bit too green so I don’t know if I wan to go in with some other colors to make him stand out a bit. It all depends if I want to play the Tetrad some more. Finally I have the Tzeentch prince where I used the body from the Silver Tower Minotaur thing, some Scourge wings again, and some random Pink Horror Arms. The guy is a bit small and I am not 100% happy with the blue “runes” in his flesh. This was the last guy I was doing and I had some other stuff to finish up. I will probably go back and work on him after I knock out some other commissions and upcoming nonsense. Overall I was pretty happy to have a new Tetrad painted up and just have the options to play some big MC’s again. The list was for a 2000 pt game so it gets harder to fit a fully operational Tetrad in my Murder Horde. I think there is a good one for normal 1850 events but that is something else for another day. I got an upcoming Tetrad army commission too – so it still looks like I will never stop making big fat monsters.